If one simply cares to have a look … And knows what to look for. Remember that solar-heated (warm) water stored at depth, away from the surface, is not available to cause global warming from the surface up. Even if it’s ‘there’. Only once it’s brought up to and spread out over some part of the ocean surface it is. Bear this in mind also. It is key. I owe the original inspiration, the epiphany and the knowledge behind this post mainly to Bob Tisdale. He’s the one who originally pointed out and explained my Steps 2 (the 1988 one) and 3 (the 1998 one) in the global/regional SSTa data. I will start by reiterating the essential point I made in my last post about understanding what the ENSO process really is (once again, Tisdale is the one who originally brought these ‘news’ to the world): NINO3.4 SSTa and ‘ENSO’ is not one and the same! You cannot look solely at NINO3.4 and expect to have accounted for the full ENSO phenomenon and its total effect on global climate! 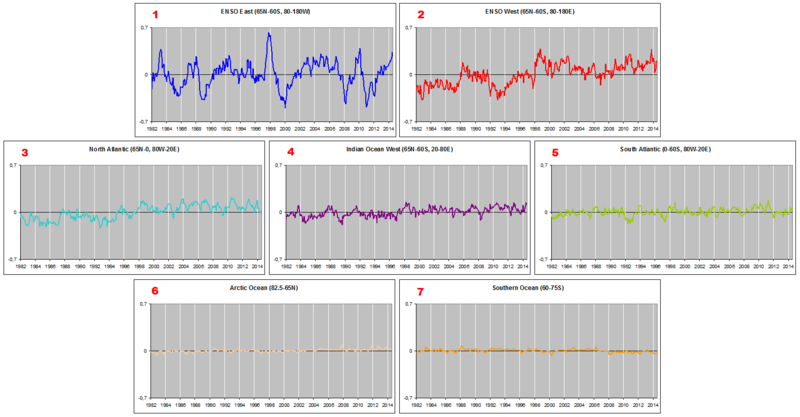 The NINO index does not capture in its signal all the effects of the ENSO process. This is precisely what Trenberth’s ‘ENSO residual’ is all about. ENSO as a large-scale, coupled oceanic/atmospheric process includes more, much more, than the surface temperatures of some narrow stretch of ocean in the eastern tropics of the Pacific. I wish that people would begin to get this into their heads. That’s really all you ever need to know: ‘ENSO’ is more than NINO3.4 (hey, it even rhymes!). Once you do, you will see at once and all by yourself (it’s almost uncannily obvious, to the point of being near-intuitive) how multidecadal ‘global warming’ (and cooling) comes completely natural. I know Tisdale has been on about this for quite some time. And still we see, on a regular basis, self-proclaimed ‘experts’ on the subject lining up to conflate NINO3.4 data with the (total and final) ‘ENSO signal’ on global temperatures. These are people that honestly should know better. Trenberth even shows us that he indeed does know better in his paper from 2002 (quote above), but still he refuses to acknowledge what that insight necessarily entails, refuses to follow the corollary of his admission to its natural end. Figure 3. 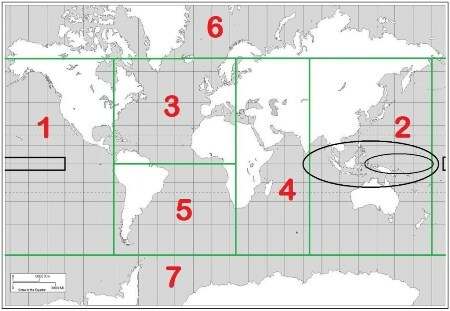 The SSTa of seven sectors of the global ocean when area weighted against the East Pacific (1). Figure 4. Sector 1 includes the NINO3.4 region (black rectangle) while Sector 2 includes the WPWP and the IPWP (black ellipses). Note that the projection used makes areas towards the poles look way too large. So for most of the time, NINO3.4 (representing the East Pacific) actually does act as a good proxy for the total ENSO signal. Simply because it’s so powerful. Since 1970, it’s actually been like that for 41 out of 44 years. That’s 93% of the time. Not quite as good of course as the certainty (without any basis in science, as a matter of fact, without any real-world empirical evidence whatsoever to back it up) of the IPCC in their ‘Fifth Assessment Report’ that our CO2 emissions is what caused the majority of ‘global warming’ over the same period. But, still pretty impressive. 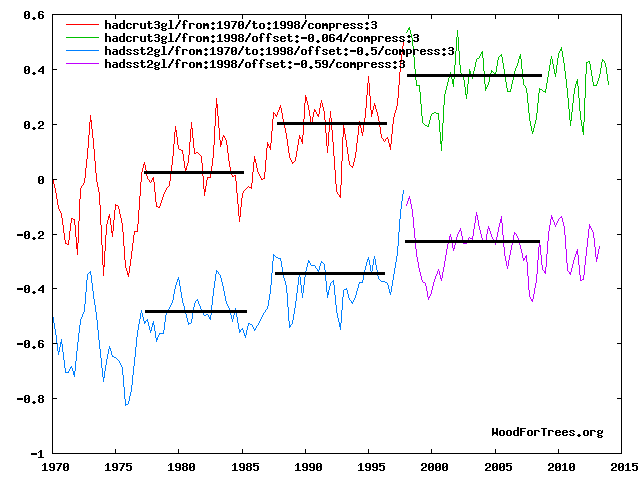 Global temperatures only diverge permanently from NINO3.4 at three specific instances during all those years (Figure 2), by lifting abruptly away from it inside the span of a year. It happened in 1979, in 1988 and in 1998. It stands out, plain as day, in the data. There’s no denying it. It’s there. Right in front of us all. We’ve already accounted for the 1979 global step (Step 1). It occurred as a direct result of the PDO (PDV) phase shift from a ‘negative’ (cool) to a ‘positive’ (warm) regime in 1976/77, as the East Pacific experienced a significant wholesale surface warming while the West Pacific did not similarly cool to offset that warming (“How the world really warmed …, Part II: Step 1″). We’re left with Steps 2 and 3 in Figure 2, both so to say taken inside the new and ‘warm-favouring’ climate regime of the Pacific established with the 1976/77 shift. 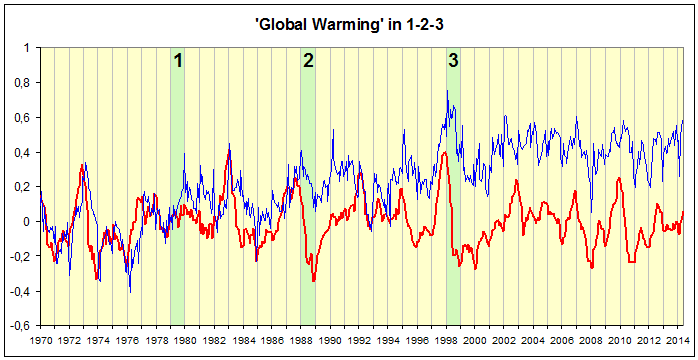 In 1988 and 1998 global temperatures once again diverge suddenly and permanently from NINO3.4 (Figure 2). Something happened outside the NINO3.4 region at these two specific times that massively affected global mean temperatures, but which was thus specifically never captured by that ‘key ENSO index’. This ‘something’ must have been so out of the ordinary as to disrupt the world’s normal linear response to the East Pacific signal. And we shall see that this ‘something’ is still very much ENSO-related. We see it in the data. We can track it. We can see when it happened and where it happened. It’s only silly to try and deny it. Steps 2 and 3 were created in the exact same way. By the same processes. Bob Tisdale has already shown us what happened and how it happened thoroughly on his website, but I will provide my own summary here. The two regions in question are the West Pacific and the North Atlantic (note that the map projection in Figure 5 progressively overscales areas away from the equator; the North Atlantic in reality only covers about 12% of the global ocean. What’s interesting with the West Pacific and the North Atlantic is how integrated a part of the larger coupled oceanic/atmospheric ENSO process they both are, the former directly (oceanically) linked, the latter indirectly (atmospherically) so. The West Pacific responds without a lag, but in an inverse manner, to what happens in the East Pacific (in fact, one shouldn’t really call it ‘responding’ at all; the two ENSO basins rather make up the opposite ends of the same ongoing pendulum process). The North Atlantic responds (and here it is proper to call it just that) in a direct manner, only with a considerable lag, to what happens in the East Pacific … most of the time. Figure 6. Top chart: North Atlantic SSTa (blue curve) directly synchronised with the ‘Warm West Pacific Horseshoe’ (WWPH), corresponding to the striking ‘Pac-Man’-like shape seen in Figure 5; WPWP+KOE+SPCZ (yellow curve). Central chart: North Atlantic (blue) vs. scaled and lagged (by 7 months) NINO3.4 (red). Bottom chart: WWPH (yellow) vs. scaled NINO3.4 (red). 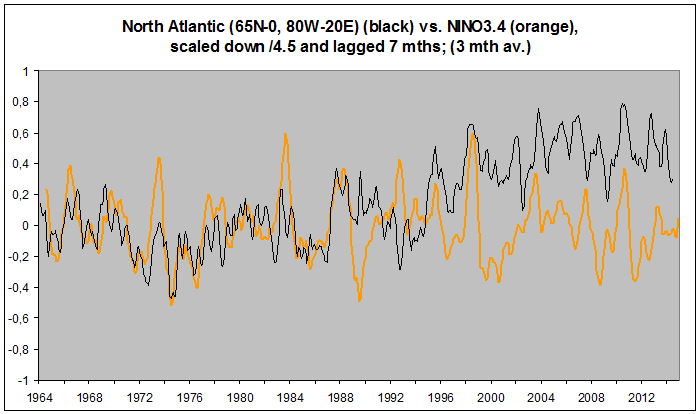 Note how in Figure 6 the direct North Atlantic SSTa response to the East Pacific signal is considerably lagged, but because the West Pacific is inversely related to the East, the North Atlantic El Niño peak is still reached on average a few months before the following West Pacific La Niña peak. So the two curves appear to correspond directly, with the North Atlantic leading, but in reality they do not correspond directly at all; their connection goes through the East Pacific, one inversely related, the other one lagged. Let’s have a look at the West Pacific first. The exact same thing then happens in 1997/98 and down toward the 2002/03 El Niño: The green western SSTa curve suddenly towers up above the NINO3.4 curve and refuses to settle back down. And in 2010 it happens yet again; the ENSO settings here are pretty much exactly the same as on the two previous occasions*, but this time around the resulting rise is much more moderate – the whole process seems to have lost its ‘oomph’. 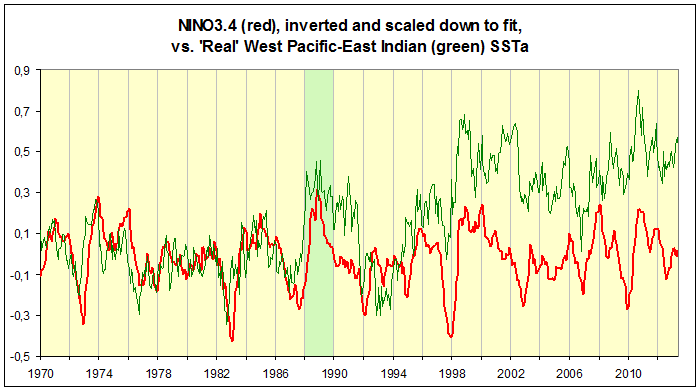 In fact, if one consults the more regional data, one will see that this final small rise is actually solely derived from the East Indian part of ‘Real’ ENSO West, not at all from the West Pacific part (compare the end of the green curve (‘Real’ ENSO West) in Figure 7 with the yellow curve (WWPH) in Figure 6). From 1970 till today we’ve had four rounds of great solitary El Niños preceded and succeeded directly by prominent La Niñas, most of the time multiple-year ones which thus notably always timewise comfortably outdo the central El Niño. In between these striking periods of major back-to-back events there are extended stretches without real La Niña conditions, with the ENSO state mostly fluctuating between neutral and warm, the swings being on average much smaller than in the distinct ‘Niña-Niño-Niña’ segments. There are significant El Niños also within these more ‘muted’ sections of the ENSO sequence, but they are never ‘solitary’ like the 1972/73, the 1986-88, the 1997/98 and the 2009/10 events. And we notice in the data how their impact on global mean temperatures is consequently much harder to spot, in fact many times it’s all but nonexistent. 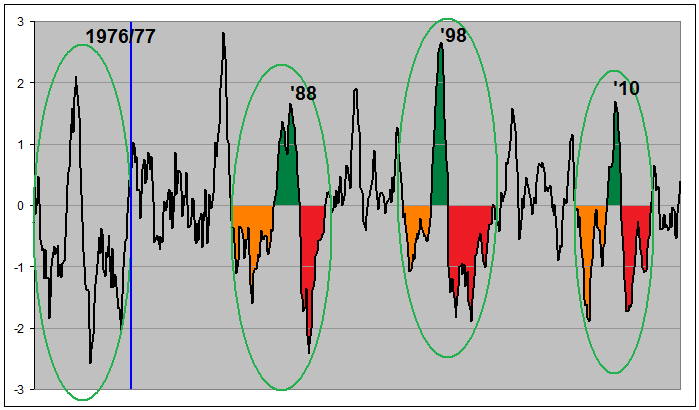 Basically, the ENSO events contained within the four green ellipses in Figure 8 above are Trenberth’s ‘larger events’ since 1970, whose signal rises above the regional noise of the rest of the world, effectively drowning it and leading global temps by on average three months. According to most comprehensive data analyses of OHC (Ocean Heat Content), the bulk of the global ocean started warming (experienced a net accumulation of energy) in 1970, just as this characteristic ENSO sequence started rolling. 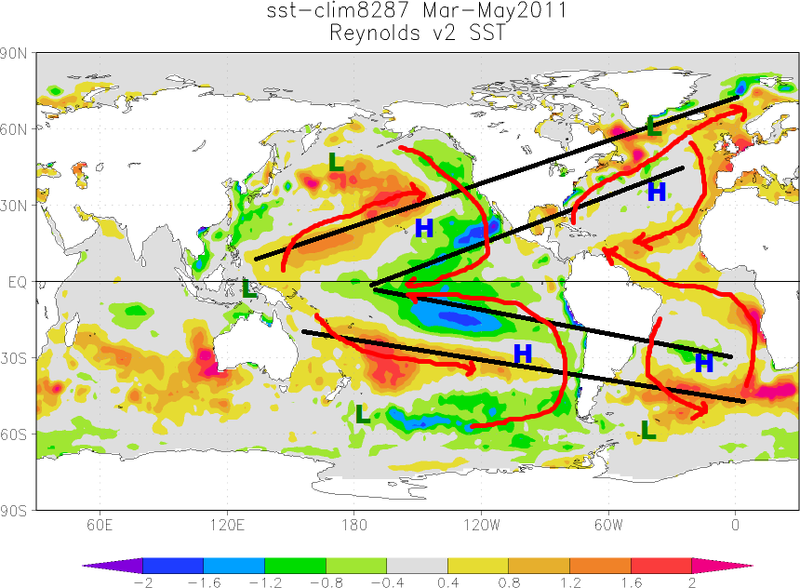 The general rise in global OHC since then is therefore clearly connected to these four great La Niña-periods, split only by brief, but very strong El Niños in between. This is fairly easy to show from the available OHC data. You need only divide the global ocean into two oppositely fluctuating (pendulum) ‘basins’, the one swinging with the WPWP and the other swinging with NINO, the two inversely related sectors of the ENSO process. The picture, then, becomes very clear. But this is a subject we won’t get into in this particular series of posts. We’re only interested here in the modern ‘global warming’ from surface up. OHC, most interesting in its own right, is for later … One thing at a time. 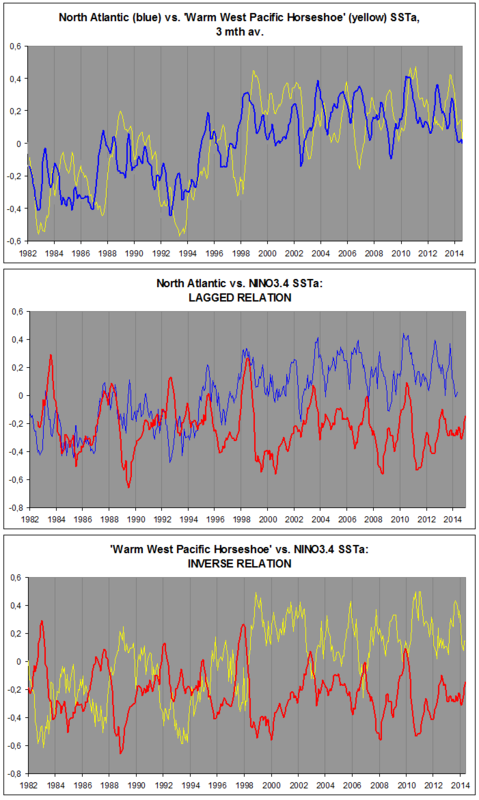 As always, the South Pacific is much less well-studied than the North Pacific, but there are reasons to believe once more that there were similar shifts occurring at the same approximate times south of the equator in the Pacific basin, mostly deduced from the fact that the general temperature anomaly evolution of the SPCZ between 1980 and today more or less matches that of the KOE exactly. Leftover warm water from the dying El Niño. Freshly generated warm water from the growing La Niña. From studying the data, we can see how at some point before the peak of the El Niño, the static (one could almost call it ‘paralysed’ or ‘lethargic’) atmospheric state in the enormous central Pacific broke up, westward winds across the tropical basin picked up again and within just a few months, normal circulation was reestablished. But at this point, huge expanses of warmer-than-normal El Niño water still remained at or near the surface in the East. It never had the time to dissipate before the pendulum turned. And now it got pushed back by the trades to where it was originally drawn from, the WPWP, but also floating back west outside the tropical zone via massive so-called oceanic Rossby waves. 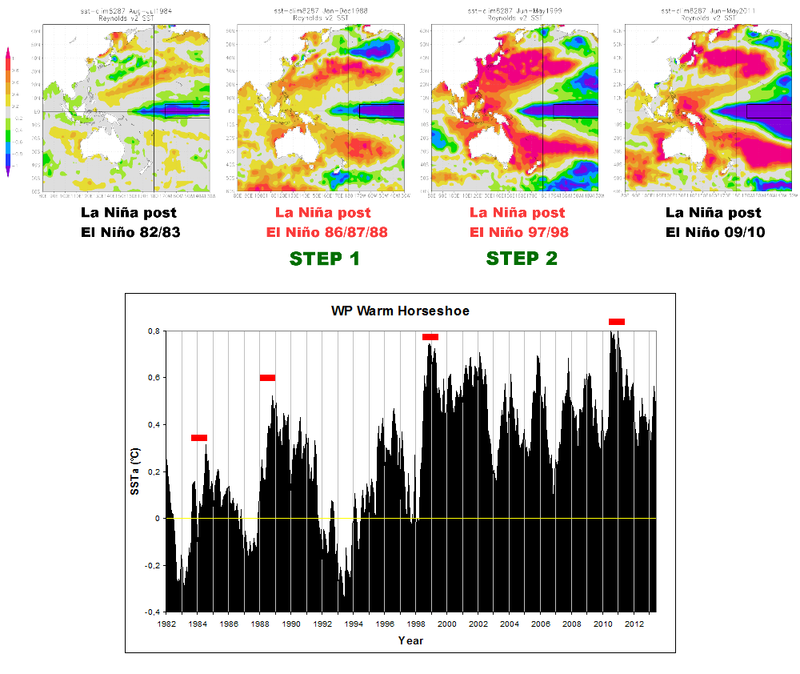 The first La Niña, the one preceding the El Niño, accumulated the original fund of solar-heated warm water in the WPWP, to be used as ‘fuel’ by the coming El Niño, mostly away from the surface, stored significantly at depth. Then the El Niño pulled this warm water up and out and spread it across the surface to create ‘global warming’. But the El Niño was too strong and too brief. It could not get rid of all its retrieved warm water in time before its eventual demise. Much remained on the surface in the East. This leftover warm water thus came on top of, in addition to, the ‘new’ warm water now being generated, taken to the West and stored up during the second La Niña, directly on the heels of the El Niño, expanding the WPWP. Moreover, the eastern leftover warm water being brought back West outside the central tropical conveyor belt, also to a large extent ended up on the surface, because there is no deep-water storage going on in the KOE and the SPCZ as there is in the WPWP, so here it more readily buoys up. All this extra-ordinary piling up of warm water on the surface of the West Pacific, then, helped to counter the eastern La Niña cooling much more effectively than usual. We see this plainly in the all-Pacific data, resembling very much the global. This naturally brings us to the North Atlantic. Because this distinct course of events in the Pacific also ended up greatly affecting the SSTa evolution of the North Atlantic basin, being strongly influenced by what happens in the Pacific. So what exactly happens in the North Atlantic? It normally owes its general SSTa progression to what happens in the tropical East Pacific (NINO3.4), warming (and cooling) the following season (NINO peaks around December/January, North Atlantic (Warm Pool) peaks around June/July). But not always. 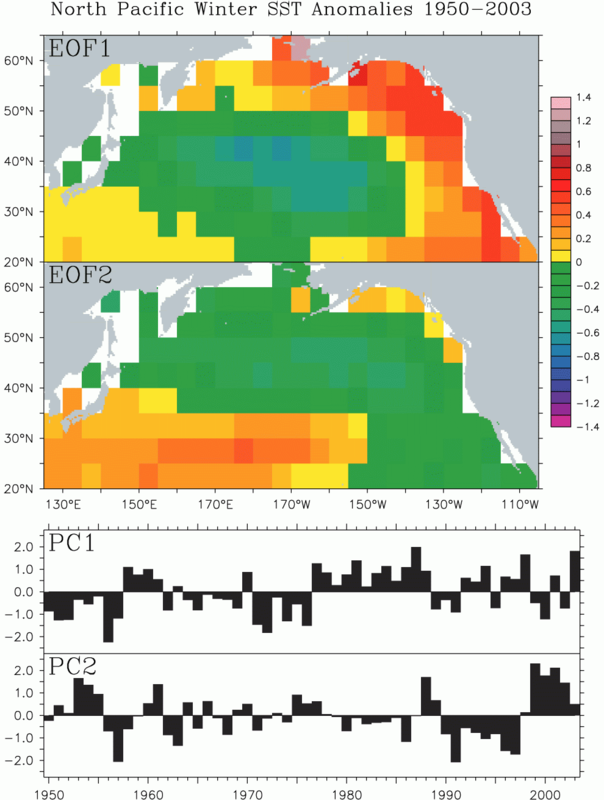 There is a lot of Atlantic noise, especially and specifically outside the big ENSO events. Remember what Trenberth pointed out (top quote): “(…) it is in [the larger] events that the signal is clearly larger than the noise.” The Atlantic noise doesn’t really matter much to the overall SSTa evolution, though. It’s clear from the data (above), after all, that the decadal trend of the North Atlantic is not free to stray from the East Pacific one. No, when the North Atlantic does in fact deviate from the East Pacific, it does so in very distinct and massive steps, in sudden instances of surface heat accumulation defying the clear calls for cooling from the East Pacific lead (Figure 11, Animation 2). So how come the North Atlantic refuses to cool proportionally along with the East Pacific during the 1988/89, the 1998/99 and also the 2010/11 La Niñas? Go back and study once more the three graphs in Figure 6. But observe then, as the quickly ensuing La Niña is establishing itself firmly in the East Pacific, how the normal Atlantic response to this appears never to gain a proper foothold; as it seems, likely because of the simultaneous mid-latitude atmospheric response to what happens in the West Pacific (the KOE). Figure 12. Global SSTa situation in the boreal spring of 2011. I’ve highlighted the grand-scale patterns of anomalies (straight black lines) going from the Pacific to the Atlantic via the troposphere, the pressure cells (Highs and Lows) and the corresponding circulation systems (red arrows). Watch how there is substantial general movement of (warm, tropical) air and water from the South Atlantic across the equator to the North Atlantic basin. This is something we don’t see in the Pacific. It’s a result of the difference in configuration of the continents surrounding the two oceans. The warm pool naturally collecting towards the western edge of the Pacific basin straddles the equator, while the equivalent warm pool in the Atlantic basin is shifted way to the north, centred on the Caribbean and the Gulf of Mexico and consequently fluctuating much more with the seasons (refer to the Wang quote above). 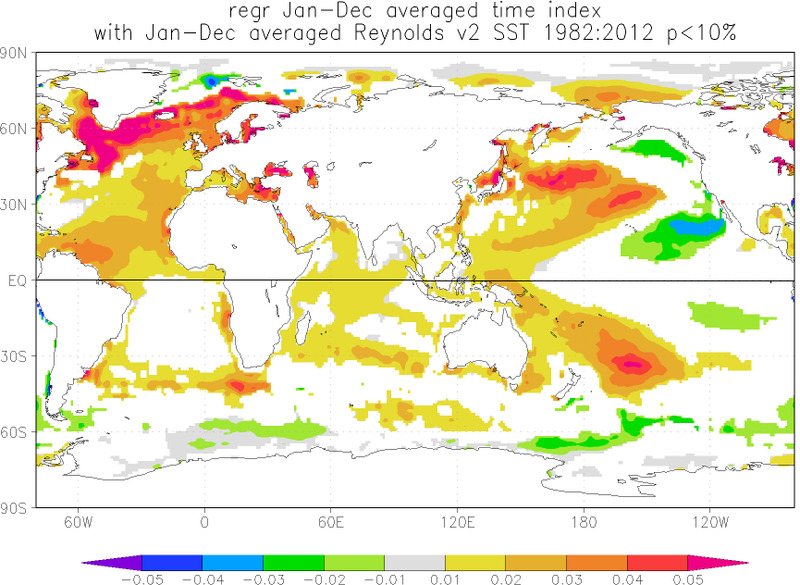 There is no warm pool in the South Atlantic. Also observe how, for the same general reason, the mean transport of water, air and thus energy in the wide Pacific basin is zonal (east <-> west), while in the more narrow North Atlantic basin it is meridional (south <-> north). This post has gotten long enough at this point. I urge you not primarily to focus on what I’ve been saying about mechanisms and processes behind Steps 2 and 3, the explanations given for them, in this post, but to rather focus mainly on the actual global and regional data I’ve presented. It itself should suffice. By all means, look at it – its varying amplitudes, its spatial distribution and its timing – and make up your own mind. How would you explain global Steps 2 (1988) and 3 (1998)? Figure 13. 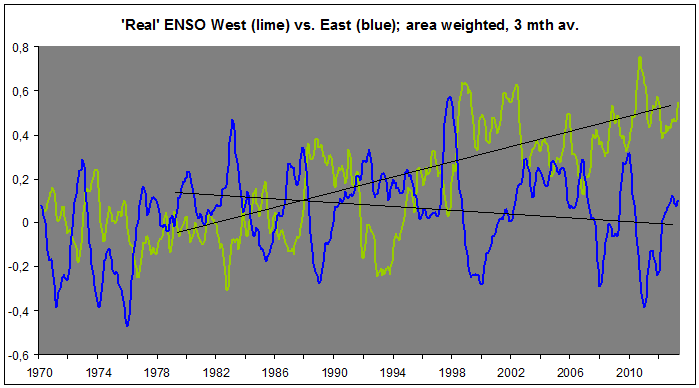 ‘Real’ ENSO West vs. ‘Real’ ENSO East. Have a look at the two trend lines in Figure 13 starting around 1979/80. ‘Real’ ENSO East has generally cooled since this time, while ‘Real’ ENSO West has warmed, quite in accordance with the inverse relationship between the two basins. What you will notice, however, is that West has warmed considerably more than East has cooled (the data behind the two curves are area weighted against each other, so are directly comparable in a ‘global contributional’ sense). We know now that this results specifically from the excessive and swiftly unfolding ‘response’ of western SST anomalies (primarily confined to the WWPH: WPWP+KOE+SPCZ) to two distinct, major El Niño/La Niña transitions taking place in 1988 and 1998 respectively. Recall how Step 1 came as a result of an East Pacific surface warming not countered by a proportional West Pacific cooling. Steps 2 and 3 were likewise caused by instances of West Pacific surface warming prominently outdoing the corresponding East Pacific cooling. The North Atlantic (and the Indian Ocean) in turn added to (and resulted from) these two instances of West Pacific warming. In other words: Step 1 was an East Pacific step. Steps 2 and 3 were West Pacific steps. The physics behind this multidecadal warming (and the equivalent cooling) process is really very simple and basic. There’s nothing novel or mysterious (or “anti-scientific”) about it: Solar energy input to the global ocean (cloud variation) and subsequent oceanic/atmospheric (temporal and spatial) distribution of this energy to the world (pressure/wind variation). La Niña takes up solar energy, El Niño releases it back out. There’s an inherent ‘give-and-take’ kind of balance to this process that will necessarily always struggle to remain symmetrical over certain time intervals – in reality, it can never be, and never is (in the short and medium terms). The ocean rather fluctuates Earth’s climate around a solar mean: warming, cooling, warming, cooling. This entry was posted in Natural 'Climate Change' and tagged East Pacific, El Niño, ENSO, La Niña, North Atlantic, North Pacific, OHC, PDO, trade winds, tropospheric bridge, Victoria Pattern, West Pacific. Tusen takk for disse artiklene, det er en fryd å lese dem. Ventetiden mellom hver artikkel er lang og kjedelig, dette er nesten som å se en spennende TV-serie der man ikke vet når neste episode kommer!